This is one meaty pizza - the classic ribs and pizza combo in one! The tomato chilli Relish is complemented beautifully by the sweetness of the red onion and is sure to impress. Add 50 ml of the olive oil to frying pan and cook the steak. Slice and set aside for use. Place the garlic into a roasting pan and drizzle with the remaining oil. Place in oven and cook until soft, remove and set aside for use. Spread the KNORR American Tomato Chilli Relish GF evenly onto the pizza base. 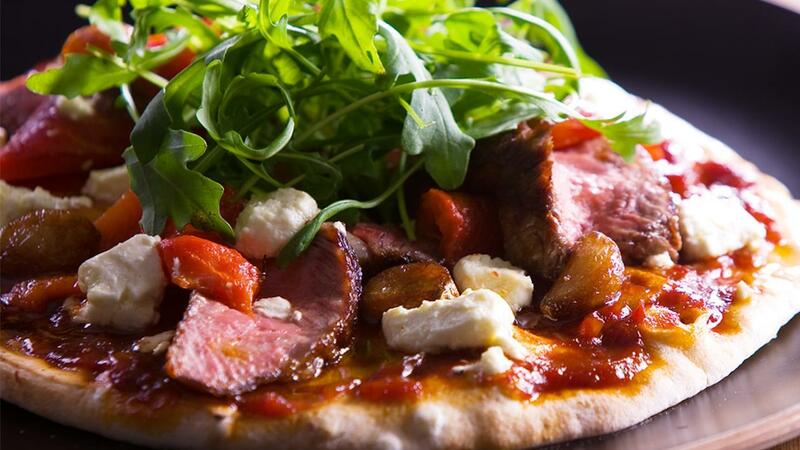 Add the rest of the ingredients in the following order - grilled steak, roasted capsicum, red onion, garlic and feta. Place in the pizza oven until cooked. Remove and garnish with the wild rocket.